"Japanese culture and animation scholar Susan Napier explores the life and art of this extraordinary Japanese filmmaker to provide a definitive account of his oeuvre. Napier insightfully illuminates the multiple themes crisscrossing his work, from empowered women to environmental nightmares to utopian dreams, creating an unforgettable portrait of a man whose art challenged Hollywood dominance and ushered in a new chapter of global popular culture." 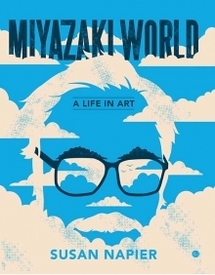 Miyazai World is a 300 page hardcover, illustrated in black & white, plus a 16-page section of full color plates.